KEIN HEIM IN SICHT _ GLEICHGEWICHT is a conversation between two voices based in the Canadian Prairie, Heather Benning, a classical sculptor with a contemporary approach to media and material and Lisa Birke, performance-for-video artist. Both artists deal with relateable themes and everyday fears even though their works are based in different materials and genres. „All Safety Gone“ by Heather Benning refers to John Steinbeck´s East of Eden, a novel about precarious economic situations and family troubles. 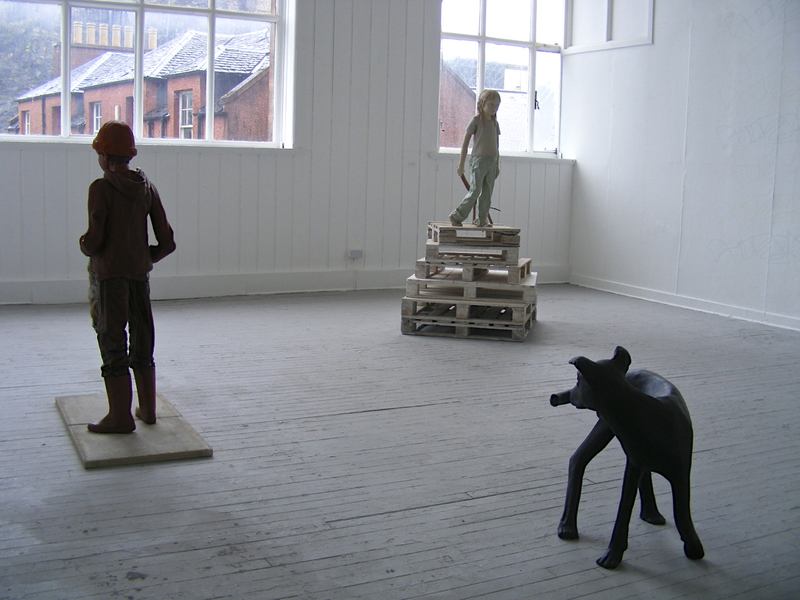 While Benning completing her MFA in Edinburg, she created the three sculptures which are direct referenced to that novel. The work was created between 2008 and 2009, during the economic crisis and the following collapse. The personally experience was also influencing the creation of the figures. The common feeling of pulling the ground under our feet and the fear of a uncertain future affects the artistic procedure as well. ‚The Knits‘ follows the arduous task of knitting a sweater, while at the same time watching this same sweater unravel as it makes its way across Canada. Along the way, the film tugs at the crossed threads of familial ties, art versus craft, gendered materiality, and the relationship we have with mother nature and her great divide. „Endgame“ is a rumination on dualistic thinking as pitfall of the human condition—metaphorically situated in both personal conflict within the self and interpersonal conflict between groups of people from a socio-political standpoint. In a single-channel video installation, good and evil, us and them, brawn and beauty, and black and white are pitted against one another in a psychological drama where no winner can be declared. A field of ladies, one side clad in white dresses and the other in black, stand face-to-face entrapped within a choreographed and mythological battle of will and death that is locked in an eternal stalemate. Heather Benning currently lives and works in rural Saskatchewan. She completed a bachelor of fine arts degree from Nova Scotia College of Art and Design in 2004, and a master of sculpture at Edinburgh College of Art in 2009. Between her degrees, Benning returned to Saskatchewan, where she completed several large-scale, site-specific installations. She has had numerous solo and group shows throughout Canada and abroad. Heather’s work has been reviewed in Canadian Art magazine, Sculpture magazine, Galleries West, Espace, and Uppercase Magazine, Studio Magazine, The Paris Review, and The Nation Post, etc. She is predominantly a sculptor that dabbles in multimedia. Lisa Birke is an award winning Canadian experimental short film maker who situates between the traditions of painting, digital video and performance art. She has had solo exhibitions across Canada and her short films have been screened at film/video festivals and media centres internationally, including amongst others: Vancouver International Film Festival (Canada), Slamdance Film Festival (US). Birke created projects for CAFKA (Contemporary Art Forum Kitchener and Area), the Kitchener Waterloo Art Gallery in 2016 and has just completed “The Knits” with the support of an Ontario Arts Council Media Artists Project Creation Grant. Lisa Birke examines notions of ‘self’ through the lens of gender, bringing the cultural tropes of woman into focus and into question. Filmed unaccompanied in the Canadian landscape, absurd yet insightful performative acts become entangled in nuanced and complex narratives in single and multichannel video works that make reference to art history, mythology and popular culture. Birke is currently Assistant Professor of Digital and Extended Media at the University of Saskatchewan.